Shopping for Care Bears Pop! Vinyl Figures? 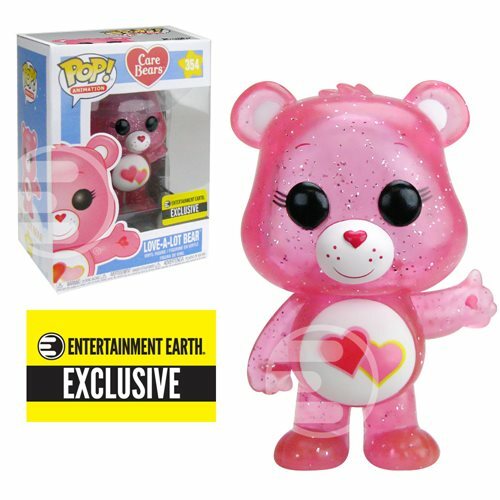 Exclusive Care Bears Pop! Vinyl figure! This super-cute Love-a-Lot Bear features a translucent glittery deco. Add a little shine and sparkle to your collection! Entertainment Earth Exclusive! Get ready to care a LOT! Those snuggly furballs known as the Care Bears are undergoing a Funko transformation, so here's your chance to make your collection the most adorable - and sparkly - on the block with the Care Bears Glitter Love-a-Lot Bear Pop! Vinyl Figure #354 - Entertainment Earth Exclusive. This super-cute little bear is sparkling with love, thanks to its exclusive translucent glittery deco. Love-a-Lot Bear measures approximately 3 3/4-inches tall and comes packaged in a window display box. Take it home!